There was no winner of this weeks Lucky Dip. Numbers drawn 2,17,21,36. Next weeks Jackpot is â¬2760. There was no winner of this weeks Lucky Dip. Numbers drawn 3,6,14,23. Next weeks Jackpot is â¬2450. There was no winner of this weeks Lucky Dip. Numbers drawn 3,6,22,35. Next weeks Jackpot is now â¬2040. Tickets for Dublin's All Ireland Semi Final Replay on Saturday 5th September MUST be ordered by 6pm SHARP on Monday 31st August! !Orders should be sent to Tom on 0872345947 by 6pmNo Late orders will be excepted!! Dublin Progress to Meet Armagh in All Ireland Semi Final!! 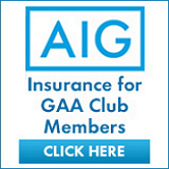 Dublin Progress to Meet Armagh22 Aug 2015 Dublin 1-13 Monaghan 0-13 Dublin held off a stiff challenge from Monaghan to prevail in their TG4 All-Ireland Ladies SFC quarter-final at St Tiernachâs Park in Clones this afternoon. Dublin All Ireland Semi Final Ticket Order Details!!! Dublin All Ireland Quater Final Ticket Order Details!! There was 1 winner of this weeks Lucky Dip. Numbers drawn 6,14,24,31. Next weeks Jackpot is â¬340.